With the frame completed the next logical step is to build the engine, mate it to a trans and get the whole assembly installed in the chassis. I'm not going to go into a lot of detail here. The specifics of building a Hemi are covered elsewhere on this site and there is no need to rehash what has already been covered. However, there are a couple things that were not covered in the hemi build article that need to be covered here. It seems a lot of people, when building their first hemi forget one crutial item that will ruin an otherwise good engine. Early hemis have an oil galley plug that needs to be installed in order to have good oil pressure. Without this plug in place your engine will not last long. The only problem is that its hidden in an obscure place. This picture shows the location and the best way I've found to install the plug. This plug is located at the rear of the driver's side oil galley and the only way to access it and install the plug is through the rear of the block (green arrow). You need to do this before installing the rear block plug of course.... just don't forget to do it. The second item is the front cover. There are covers available from places like HotHeads that are designed to fit behind the Chevy water pump but if you don't want to spend the cash you can make one yourself. 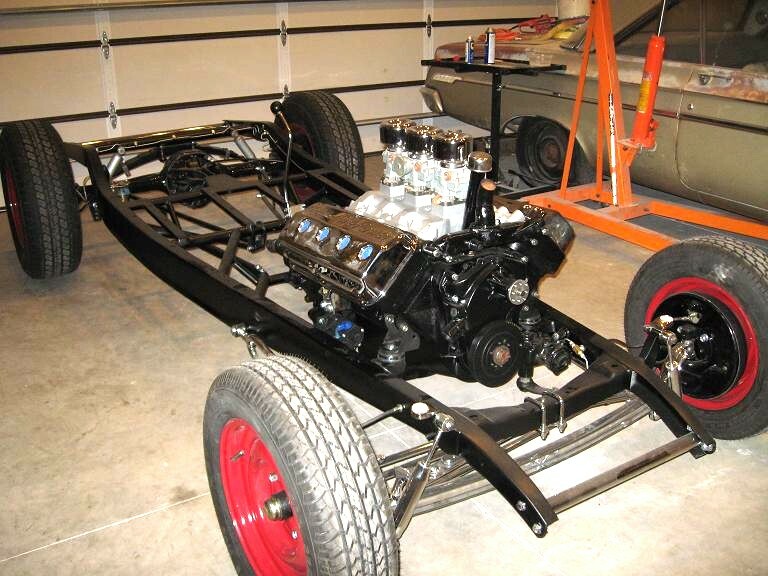 If you look at the hemi build article on this site you will see for that build I used a HotHeads aluminum front cover. On this one I decided to modify a stock cover to fit. The stock cover is seen above. What you need to co is eliminate the fuel pump mount and recess the top section enough to fit behind the Chevy pump. Believe it or not, this is not as difficult as it might sound. Here is the cover finished. The two recesses are to clear a couple of the bolts on the back of the Chevy pump. This mod needs to be done while the engine is being assembled so that you can measure for enough clearance behind the cover for the timing chain and in front to clear the pump. There is only about a quarter inch where both clearances will work so having the cam and timing chain installed and your water pump available makes all the difference in the world. It is exceedingly difficult to do this mod without the cam and timing chain installed.... just ask my how I know. Here is a front view of the finished unit. Here is the 331 that will be going into the deuce.... Well mocked up anyway. It originally was a 1955 Chrysler 300-C solid lifter dual quad engine that I rescued from a guy's back porch several years ago. Pay special attention to the valve covers in this pic and compare them to the finished product in the last picture on this page. A good chrome shop can do wonders. 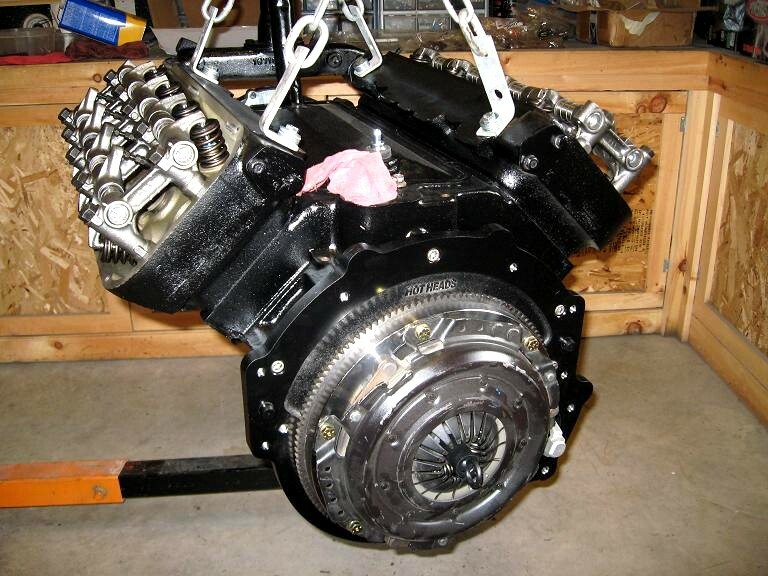 This particular hemi was bored .060 over and I installed an Isky Mega cam with hydraulic lifters to keep things simple. Because I sold the original dimpled valve covers years ago I had to use the last set I had laying around which needed some dents removed, not to mention two bullet holes that needed filling. The wire cover mounts were also removed to give a clean uncluttered look after they were chromed. Rebuilt rocker shafts were used along with a set of HotHeads adjustable push rods and HotHeads BBC water pump adapters along with the appropriate pulleys will also used. Obviously it is sporting a Weiand tri-power manifold and a set of matched Rochesters from a 1958 Chevy tri-power 348. Other than those specifics this hemi is really no different than the one I built for the truck. When I built the hemi for the truck (see 53 Chevy pickup in the past projects page) it was planned all along to use a TH-350 trans. On the Deuce the plan has been all along to use a 4 speed. Back in '64 which is the era this build represents most people were still using manual transmissions. Advances in automatics were just starting to show up and that trend just hadn't made it all the way into the hotrodding world at that time. 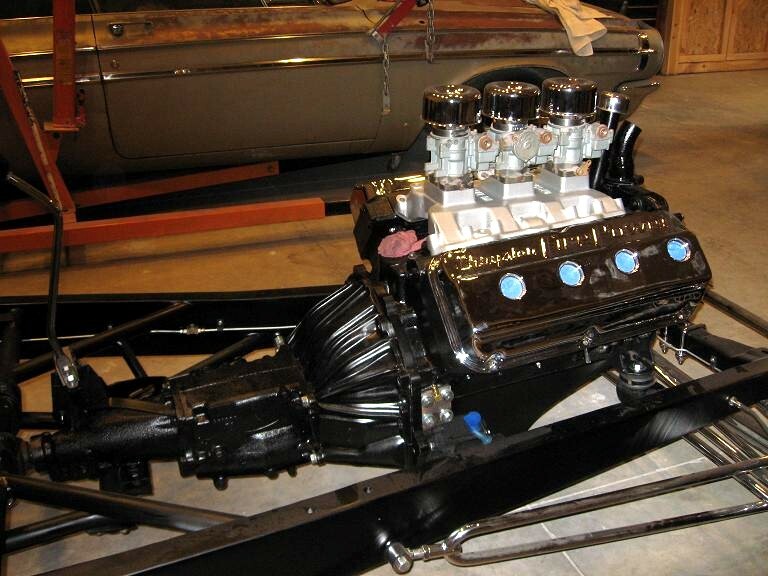 There are a few ways to adapt a 4 speed to an early hemi. 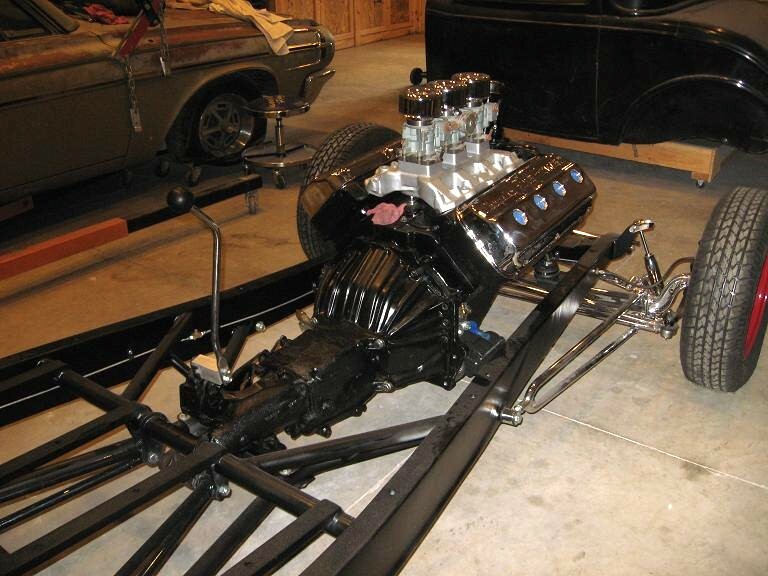 The easiest is to use an original early hemi 4 speed trans and matching bellhousing, flywheel and pressure plate. However, they are few and far between and when you do find them they can be a tad expensive. The easiest from a parts standpoint is to use one of the commercially available trans adapters and then just mount a modern 4 speed. This is the route I took but I skipped the "modern trans" bit. What I used is a HotHeads adapter which allows the mating of a GM (Chevrolet) bellhousing and trans to the hemi along with a new flywheel (with integral pilot bearing). This is also available from HotHeads. HotHeads flywheel is designed to use a 10.5" Mopar SB Borg & Beck style pressure plate. All you need is a 10.5" clutch that matches your trans along with the appropriate clutch release bearing and you're in business. All that's left is a GM 4 Speed. In my case I chose a Saginaw 4 speed, which would have been one of the transmissions available back then. Some will ask why I used a somewhat low performance trans.... well I'll tell you. Although this is a hotrod by the strictest sense of the word it is not intended to be a high revving, high horsepower, racecar. There was no reason to spend the extra cash for a high performance 4 speed. Besides the venerable old Saginaw is pretty hardy in the first place. Although the transmission adapter is designed for a SB Mopar mini starter it never hurts to check the starter and flywheel gears to make sure they will operate correctly once everything is buttoned up. All this really requires is to pull the starter gear set out from the housing and check how well it meshes with the flywheel gears. In most cases, using this adapter and starter there will be no need for any kind of adjustments. But it never hurts to make sure. Once the entire assembly was together it was mounted in the chassis. There are still a few things that need to be done such as mounting the pulleys, alternator, and headers but their time will come. The headers and turnouts will be Jet Hot coated in early August. Then I'll have to make a pair of mufflers to fit in the turnouts. Viewed from the rear. You can see in this pic the shifter arm I'm using. Although it is a Hurst shifter the arm was picked up on E-Bay and looks similar to what might have come on an Impala 409 "back in the day". You can also see a 4" aluminum block that effectively moves the shifter arm towards the passenger's side. Because the mount for the Hurst shifter is offset to the driver's side I needed to move the shifter arm over to the center of the car. The last thing you want is your right knee getting in the way when its time to shift into 2nd or 4th gear. You can see that I still have to mount the oil filter assembly. Right now I still have the pre-oiler fittings in place. I knew going in these valve covers would never be "show quality" (whatever that is) but they came out very nice and I'm happy with them.... especially considering the condition they were in. 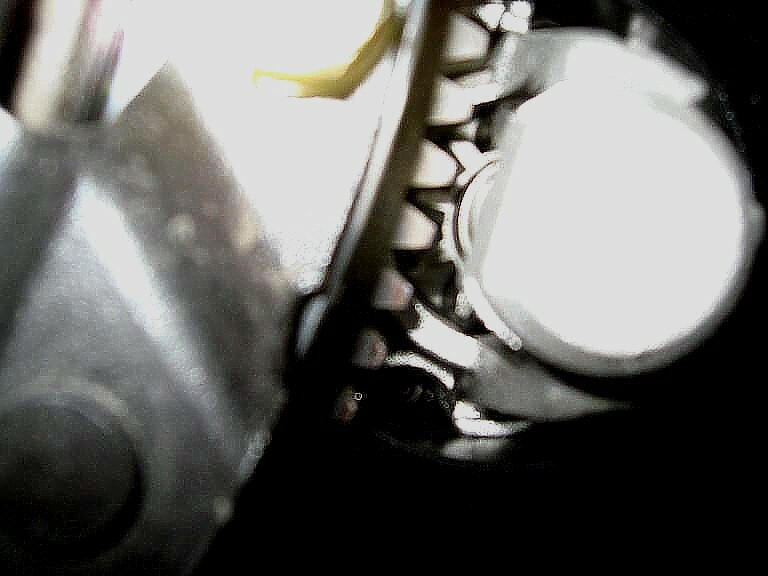 If you look closely in this picture you can see the timing marks on the crank damper. These were made using a 360-degree wheel and a cut-off wheel to create the grooves. Then some yellow automotive touch up paint was added to protect the bare steel from rusting and to make them easily visible. Over the next couple months I'll be finishing a lot of small jobs like fabing the alternator mount, hydraulic clutch setup, drive shaft, rebuilding the carbs, modifying the SB Mopar electronic distributor and completing the exhaust system.